Before heading off to the National Archives, I thought I’d do a quick post on my personal perceptions of being in Washington, DC this morning. I’m looking out over Franklin Square about the corner of 14th and K Street. As I glanced at the brightening cityscape from the rising sun about 15 or 20 minutes ago, it reminded me of years ago, sitting in my parents’ livingroom in the mornings, usually my dad and I, watching and listening to the early morning C-SPAN Washington Journal, this from Bismarck, North Dakota. Some cereal or oatmeal eating would be going on, as well as orange juice and coffee drinking. On occasion the C-SPAN commentator would remark on the rising sun. So this is the view I have this morning, not from the television (before flat screens) on the northern Great Plains, but from DC itself. There is the reality of being in Washington, DC, and then there is the idea of Washington, DC from afar. 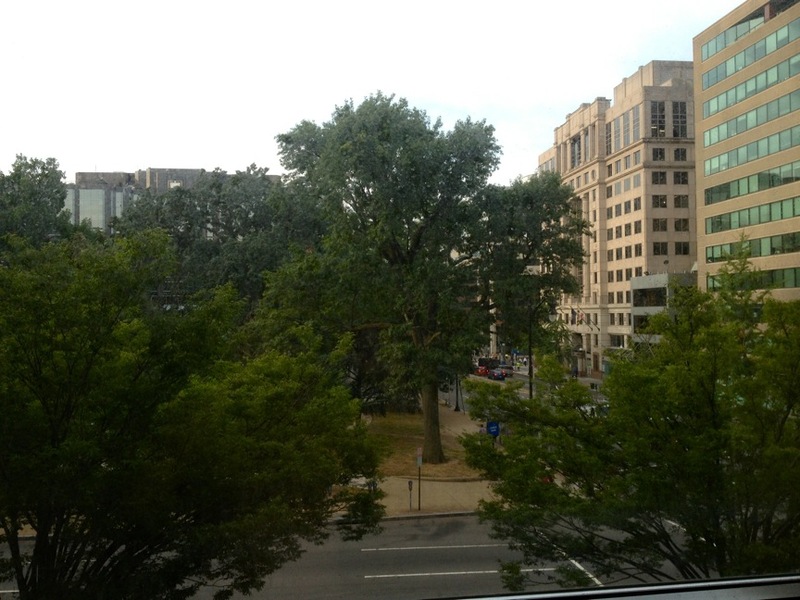 A morning view of Franklin Square in Washington, DC, from August 21, 2013. This entry was posted on Wednesday, August 21st, 2013 at 6:51 am	and tagged with C-SPAN, DC, Great Plains, Memory, North Dakota, Washington and posted in Uncategorized. You can follow any responses to this entry through the RSS 2.0 feed.